StarKist Co. is focused on providing healthy & convenient shelf-stable food products. 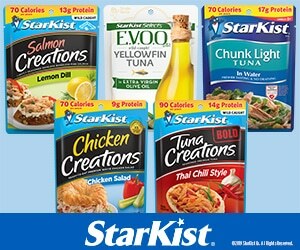 As an industry innovator, StarKist® was the first brand to introduce single-serve pouches including Tuna, Salmon and Chicken Creations™, and StarKist Selects E.V.O.O.®. For over 100 years StarKist represents a tradition of quality, consumer trust and a commitment to sustainability. Learn more about us at www.StarKist.com. In this library you’ll find information to help you educate your clients about our products, simple and delicious pairing ideas, recipe cards and fun activities for kids. If you don’t see what you need here, we would be happy to customize something for you including demos, brochures and recipe cards. We can also provide images and information for your newsletters and other communications. Just email us at dietitian@starkist.com and let us know what you are looking for. There are many different species of tuna, but only a few of them will find their way into a shelf-stable pouch or can. Here's a little information about the types of tuna you’ll find in the supermarket. Shelf stable salmon is easy to incorporate into your favorite meals. Learn about how it is prepared and makes its way to your store shelves and how it can be swapped for other protein choices in your favorite meals. Learn more here! From lean protein to Omega-3s, StarKist Tuna, Salmon and Chicken pouches aren’t just rich in flavor, they’re also packed with nutrition in every bite. This infographic will help you discover what is in every pouch!